SuperSMITH®, developed by Fulton Findings LLC, is the leading software package for Weibull Engineering. The software comes on a single CD and installs on standard Windows® systems or Windows emulators in seconds. This software performs variability analysis for life data or for dimension data. Important uses are for reliability, safety, maintainability, supportability, quality control, product assurance, sizing, and warranty analysis. 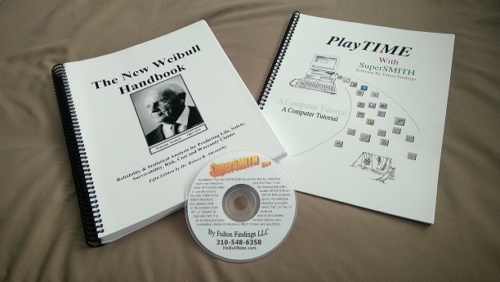 The SuperSMITH® Package also includes publications associated with the SuperSMITH® software such as THE NEW WEIBULL HANDBOOK© by Dr. Robert B. Abernethy and the PlayTIME™ software tutorial booklet. Read more about the SuperSMITH® Package below. Note that orders are filled, and technical support is provided, by Fulton Findings LLC (See notes at the end of this page). *Note: This product must be purchased separately from any other Quanterion product. SuperSMITH Weibull software: This program provides Weibull plotting solution for up to 12 data sets each with up to 32,000 individual data entries on the same plot or on separate plots, but not limited to 32,000 input values in a single set, as there is a frequency number with each data entry. Billions of data values have been analyzed for a single solution in this way. Solutions include graphical and non-graphical. There is capability for failure forecasting with or without part renewal, optimum replacement analysis for minimized cost, test requirements planning, accelerating test data modeling, and process reliability. The Weibull program includes scaling for other models besides Weibull such as Exponential, Rayleigh, Normal, Lognormal, Gumbel Lower, Gumbel Upper, and Weibayes. SuperSMITH Visual software: This is a companion program to the Weibull software for general line and point “XY” plots. Auxiliary Weibull-linked plots are probability density function (PDF), or hazard distribution function (HDF), or reliability distribution function (RDF), or aggregate cumulative hazard (ACH), or failure forecasting, or optimum replacement. Visual has unique display of data points on these auxiliary plots not found elsewhere. There is semi-log, and log-log, and Arrhenius scaling capability. Visual also provides Crow-AMSAA trend plot analysis per IEC 61710. SuperSMITH YBath™ software: This is another companion program to the Weibull software for advanced mixture analysis and plotting, with similar user-interface as the Weibull and Visual programs. One data set can be modeled with a 4-parameter, or 5-parameter, or 7-parameter solution on Weibull scaling. Batch proportion (subpopulation) represents an additional parameter within the 5 or 7 parameter solution. The New Weibull Handbook by Dr. Robert B. Abernethy: This handbook is the world standard reference for Weibull Engineering technique. Dr. Bob is the exceptional engineer responsible for the SR-71 Blackbird jet engine concept (the J58) which enabled this spy plane to remain the fastest self-powered manned aircraft for over 50 years. He also has his doctorate in statistics. His technical expertise and clear writing style makes his handbook the best guide on Weibull methods, case studies, and applications. PlayTIME With SuperSMITH: This computer tutorial booklet presents over 50 worked-out problems using the software and Dr. Bob’s methods. REQUESTS FOR PRODUCT RETURNS MUST BE DIRECTED TO FULTON FINDINGS LLC. NOTE THAT THE VERSIONS OF THIS PRODUCT ARE UPDATED FREQUENTLY. FULTON FINDINGS LLC WILL FULFILL ORDERS USING THE LATEST PRODUCT CONFIGURATION. PLEASE CONTACT FULTON FINDINGS LLC TO FIND OUT THE LATEST CONFIGURATION, OR TO UPDATE A PREVIOUSLY PURCHASED COPY OF THIS PRODUCT. STANDARD SHIPPING AND HANDLING WITHIN THE U.S., CANADA AND MEXICO IS $20.00 EACH INDIVIDUAL PROGRAM OR HANDBOOK. THE STANDARD OVERSEAS SHIPPING AND HANDLING IS $40.00 FOR EACH INDIVIDUAL PROGRAM OR HANDBOOK. STANDARD U.S. DELIVERY IS 2-DAY AND STANDARD OVERSEAS DELIVERY FOR MANY LOCATIONS IS 3-DAY. EXPRESS SHIPPING WITHIN THE U.S. IS AVAILABLE AT AN ADDITIONAL $20.00 EACH INDIVIDUAL PROGRAM OR HANDBOOK.